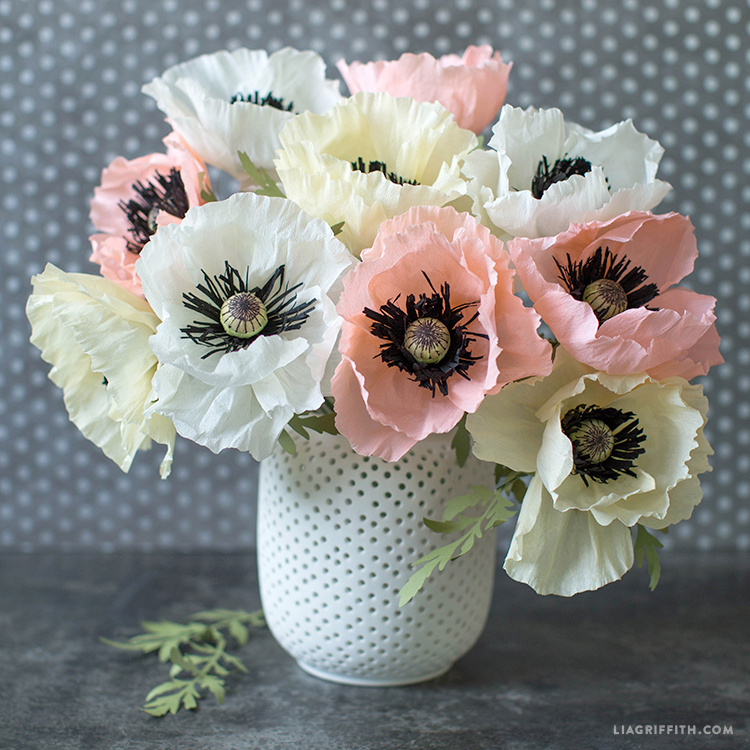 Summer is upon us and we are celebrating with some classically summer flowers! 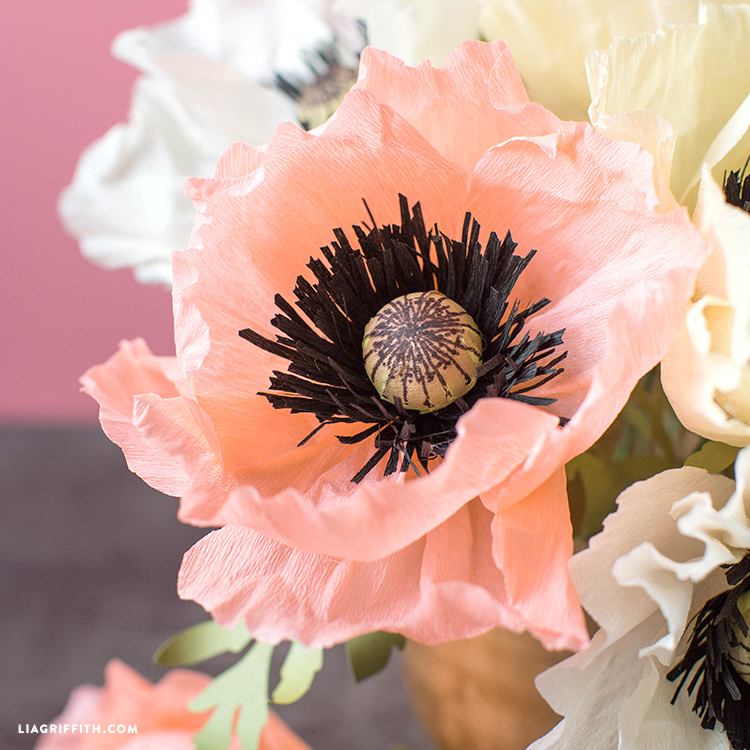 Today’s tutorial is for these gorgeous crepe paper poppies. 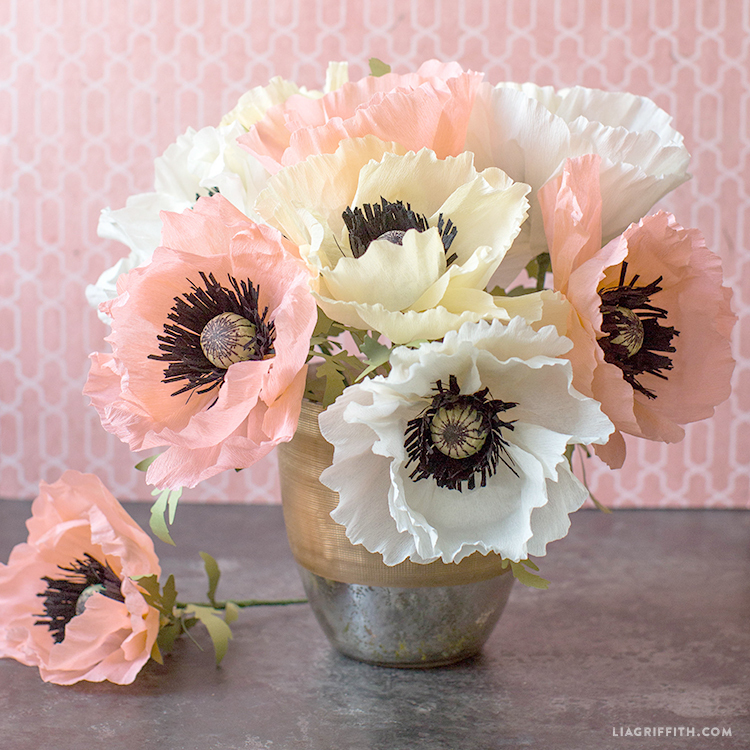 We shared our crepe Icelandic poppy project last summer, so this year we wanted to add to the mix with an oriental poppy bouquet. 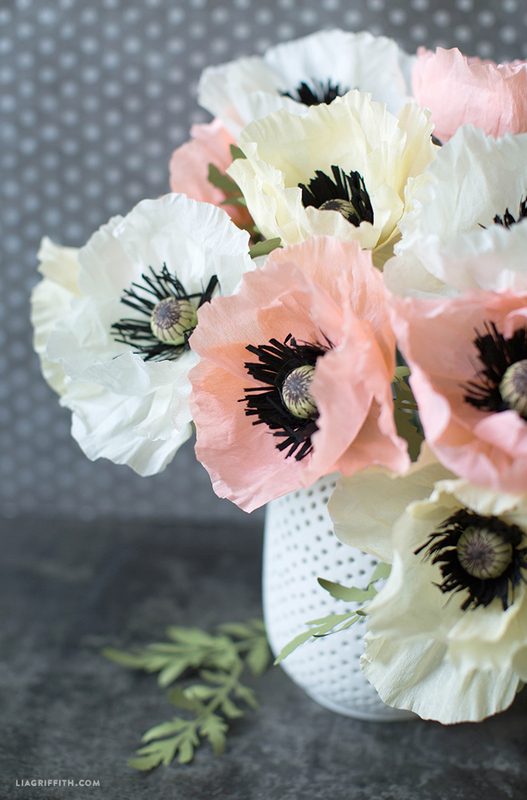 Poppy petals are very delicate, so our extra fine crepe is really conducive to giving them that realistic quality. These flowers also happen to be fairly easy to make because they only have 6 petals – a perfect starting place for beginner paper flower artists! Watch our crepe paper poppies video at the bottom of the post, or follow these written instructions for reference. Gather the tools and materials listed above. Print the PDF pattern at the bottom of the post and cut your crepe paper according to the template. Create a small loop at the end of a piece of 18 gauge wire. Poke a small hole in your foam ball with the end of your scissors, put some glue in the hole and stick your wire into the ball. Stretch the center of the circular piece of green crepe to create a cuplike shape. Cover your foam ball with this piece and attach with glue, making the paper as smooth as possible. Draw a straight line down the center of the foam ball with a fine point brown marker. Draw another line to create an x. Then draw two more lines in the same way to create an asterisk shape. Keep doing this until there are 16 lines. After you finish the blooms, add the leaves to stems. Use the PDF template if you are cutting by hand or the SVG if you have a cutting machine. 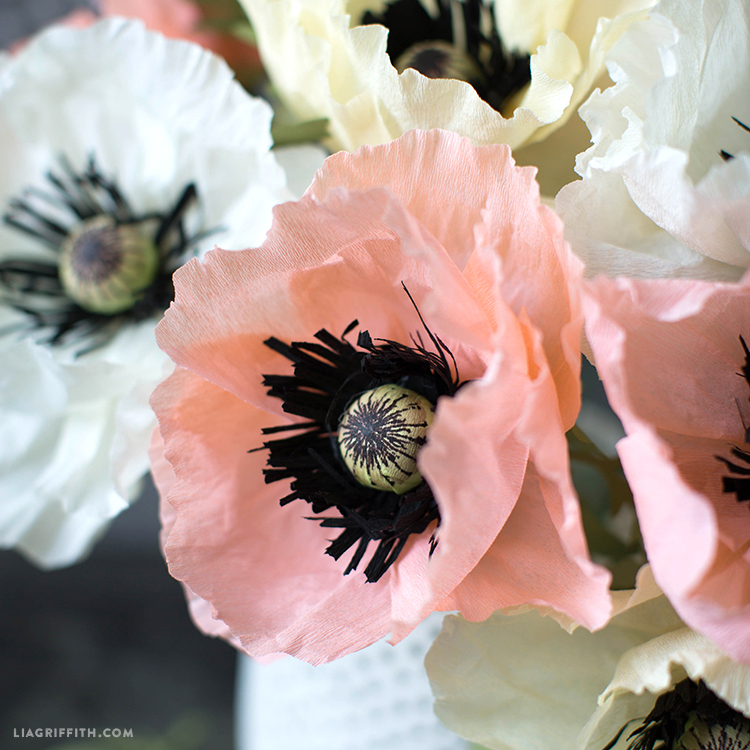 One special thing about these crepe paper poppies is that they are easier to ship than other flowers. Because the petals are already wrinkled, it is really easy to reshape them if they get a bit messed up in the shipping process. I downloaded the svg file and only the leave shows? It sounds like you only downloaded the Poppy Leaf SVG file. 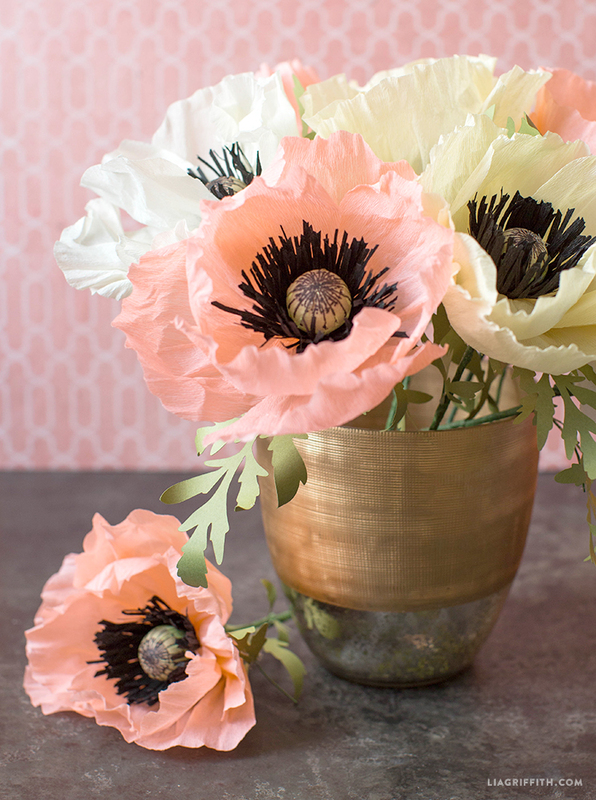 The download titled “Crepe Paper Oriental Poppy SVG Cut Files” has the flower SVG cut files. What is text weight paper? I’m sorry for the silly question…I’m a newbie!! No worries! Text weight is a lighter weight paper (as opposed to card, or cover, weight). It’s similar to regular copy printer paper in that it’s flimsier. I prefer it for most paper flowers and plants since it’s easier to shape than the heavy stuff! Thank you so much! Is there a specific color or brand you recommend? I just added a link to what I used in this project. We love PaperPapers.com for our text weight! These are beautiful Lia! Thank you for posting your projects. I’m wondering how many monthly downloads you get with a paid membership. I see the annual membership is unlimited downloads. How many downloads are we limited to if we get the monthly membership? Hi! Currently it is 15 a month. Annual members are guaranteed unlimited downloads for the duration of their membership. Again, the template lines in any color do not transfer to my black-only printing cartridge. I have brought this to your attention before. How hard would be for you to make sure and redo your templates in black only? I can’t afford a color cartridge. I am a member and love,love your site! Cynthia, we’re sorry for the trouble you’re having. It actually would be quite a lot of work to go back to templates and change the color to black 🙁 You should certainly be able to print on your printer though! We know of other members who are able to print templates on their black & white printer. When you select “print”, look for the option to change the color menu to black & white, or grayscale. I’m sorry to hear this! We haven’t heard this complaint from anyone else. It could be your internet connection or web browser– maybe try a different browser? Send us an email to hello@liagriffith.com if you’re still having trouble. Beautiful! Thank you for your time and creativity. Could you tell me the brands and colors of the markers used? Thanks! The longer marker is a Tombow Dual Brush Pen Art Marker, color is 879 brown. The other is a Copic Ciao Marker, color is E71 Champagne. great flower!! It is one of my favorites. I bought some real ones to plant but the frost got them so will make these and have no worry!! LOL Thank you so much for all your ideas!!! Love them and your site! The leaf in this SVG does not look like the leaf in the video. We just fixed the download link, it should be correct now!